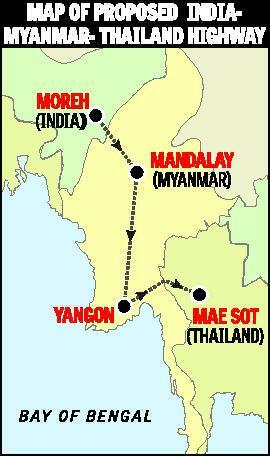 A feasibility report is being prepared for the proposed highway to connect India with neighbouring Myanmar and Thailand, the government said on Thursday. “Presently, projects are at feasibility-report stage,” Minister of State for Road, Transport and Highways, Sarvey Sathyanarayana, told the Rajya Sabha in a written reply. “India agreed to undertake upgradation of the Kalewa-Yagyi section of trilateral highway and construction of 71 bridges in the Tamu-Kalea section,” Sathyanarayana said. Earlier, Commerce and Industry Minister Anand Sharma had said the trilateral highway will be completed soon. The idea of the highway — from Moreh in Manipur to Mae Sot in Thailand via Myanmar — was conceived at a trilateral ministerial meeting on transport linkages in Yangon in April 2002. It represents a significant step in establishing connectivity between India and South East Asian countries. India imports one-third of its pulses and one-fifth of its timber from Myanmar.